Governor Godwin Obaseki of Edo State says a coordinated approach of accurate data and statistics of communities in the Niger-Delta region is pivotal to resolving youth restiveness and enhance human capacity development. Besides, Governor Obaseki said his administration is determined to curb youth restiveness and build their capacity through technical and vocational training, explaining that the state is anxious to calm the restiveness in the various communities. Speaking while receiving the Special Adviser to the President on Niger Delta Affairs and Coordinator, Presidential Amnesty Programme, Brig. Gen Pual Boroh, at the Government House, Tuesday, Governor Obaseki said, “We are anxious to ensure that we calm the restiveness in our different communities. Fortunately, we in Edo don’t discriminate. We have an all-encompassing programme that will accommodate everybody. 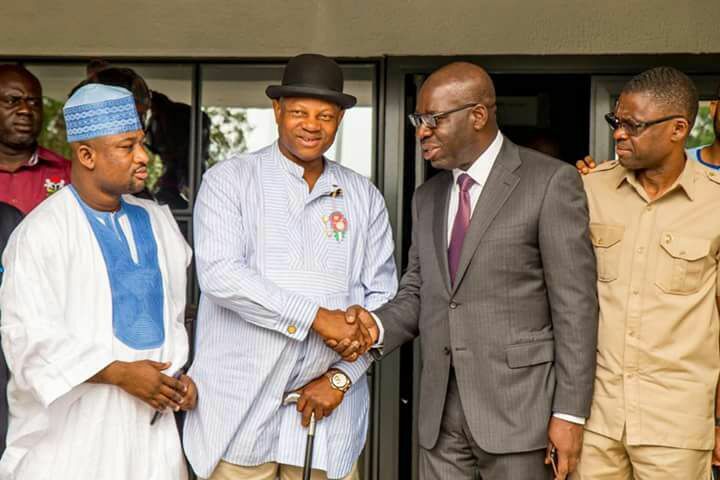 The Governor said the State Government is determined in its resolve to collaborate with the Presidential Amnesty Programme on Niger Delta to achieve its purpose for the region. Obaseki continued, “As you are also aware, our focus is shifting heavily towards technical and vocational training. We are working very hard to strengthen our technical colleges. This is an area we would like to cooperate with you. importance we place on this programme, I felt that we should meet with you no matter how brief, to appreciate you, to appreciate the work you are doing, and to also make you understand that it is something we are very cognizant of -  a programme we are anxious to participate in, and make sure it succeeds. Coordinator, Presidential Amnesty Programme, Brig. Gen Paul Boroh said, “We are here from the presidential amnesty office as a continuation of the relationship we have with Edo State as one of our strategic partners towards ensuring stability in the Niger Delta Region and particularly to re-instate thirteen thousand ex-agitators that are captured in the programme. “It is an ongoing programme that I took over in July last year - about thirteen thousand of the ex-agitators are left to be trained and empowered, but I am happy to say that Edo State is in partnership with us to train and empower one thousand ex-agitators from the ANCHOR borrowers’ initiative of the Central Bank”. According to him, “I think it is a milestone towards the resolution of the conflict in the Niger Delta because, if as many as one thousand persons are captured in terms of development in their skills and they are out of the creeks, it will encourage others who are still in the creeks to have hope that someday, they too will benefit from this gesture, which is one of the best alternatives to revamping our economy. “This is the basic reason why we came around to say, first and foremost we appreciate you, we appreciate God Almighty as well, who has made it possible for you to be on this seat. It is a hot seat because Edo State is the centre and the hub of economic activities in the Niger Delta.